Whether you want to be close to all the convenience and action of the city or within a short drive of the popular ski fields, there is a great range of Queenstown ski accommodation to suit all budgets. From the centre of Queenstown to the scenic settings of Coronet Peak Ski Field and Lake Wakatipu by The Remarkables, Queenstown ski accommodation offers an unforgettable New Zealand experience. Choose from a variety of basic yet comfortable hotels, boutique properties and scenic lodges ranging from 3 stars to 5 stars. 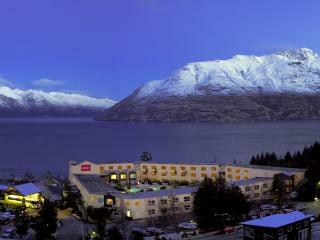 Ideally located just 10 minutes walk from downtown Queenstown, Copthorne Hotel & Apartments Queenstown, Lakeview offers a variety of hotel & apartment style accommodation with views of Lake Wakatipu & the snow capped mountains. This Queenstown accommodation boasts great on site facilities including WiFi Internet, ski lockers, laundry facilities, parking, restaurant & bar. Ideally located in the centre of Queenstown and just moments away from shops, restaurant & entertainment the Millennium Hotel Queenstown is a mere 20 minute drive from Coronet Peak, the closest ski field to the town. 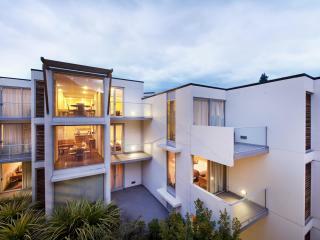 This Queenstown accommodation boasts a selection or rooms and suites which are ideal for couples or small families. 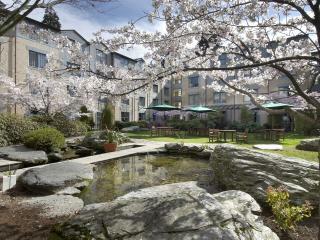 Located on Stanley Street it is a five minutes' stroll to the bustling town centre from Scenic Suites. Taking advantage of its elevated position this Queenstown accommodation captures the spectacular views of the lake and mountains. Relax in comfort at this premium location with access to great on site facilities including free parking, WiFi Internet, ski lockers, restaurant & bar plus much more. You'll love the Heartland Hotel Queenstown for its stylish contemporary comfort, unique chalet-style architecture, uninterrupted lake views and the welcoming warmth of the Fireside House Bar. 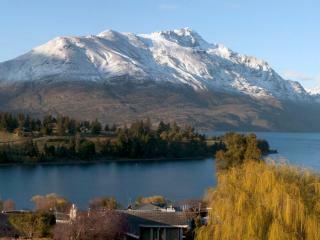 Situated on a rise just above Queenstown, the town itself is just a leisurely 5-minute stroll away. All rooms are well appointed with colour TV, in-house video, tea/coffee making facilities. Relax in the Fireside House bar, or enjoy a dinner in the award winning fully licensed restaurant - the choice is yours! Located within walking distance of the centre of Queenstown, Peppers Beacon is situated on the scenic shore of Lake Wakatipu the hotel is also just 10 minutes from the Queenstown Airport. Offering a mix of hotel rooms and apartments, the hotel boasts stunning views of The Remarkables and Lake Wakatipu and is home to an excellent range of onsite facilities. The perfect base for those who wish to explore the landscape, kick back after a busy day of skiing, snowboarding, bungy jumping and jet boat rides. This luxury Queenstown hotel & apartment style accommodation is ideally located just a few minutes' drive from the bustling city centre of Queenstown & the International Airport. Set by the lakeside The Rees Hotel & Luxury Apartments offers the perfect setting for a memorable ski New Zealand holiday on the south island with easy access to the ski fields plus a number of popular attractions. Guests have access to secure under cover parking, ski lockers, gym, WiFi Internet, laundry facilities and more. With stunning views overlooking Queenstown Bay and the Remarkables this Queenstown accommodation offers you a relaxing holiday retreat, just 5 minutes walk from central Queenstown. Highview Apartments offers a choice of Studios and 1 and 2 Bedroom Lakeview Apartments each featuring every modern convenience and magnificent views. Sit back and relax in the private BBQ area, work out in the gym or take in the magnificent view of the Remarkables Mountains from the private outdoor spa. 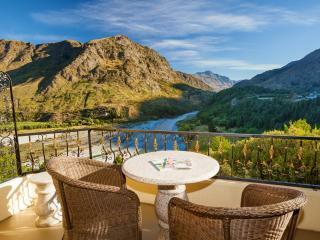 Located at the foot of the majestic Coronet Peak Ski field with breathtaking views over the famous Shotover River, Nugget Point Queenstown Hotel is a luxury boutique property and is only stone's throw away from Queenstown, yet far enough away to feel like another world. 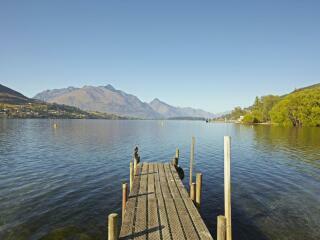 This New Zealand accommodation is ideal for couples after an amazing and relaxing time away. Situated on the scenic shores of Lake Wakatipu, BreakFree the Point offers a complex of luxurious apartment accommodation just minutes from the centre of Queenstown. Home to a great range of onsite facilities, the hotel also offers excellent recreational facilities including a fitness centre, tennis court and private jetty for fishing and boating expeditions. The hotel also offers easy access to a variety of nearby waterfront bars, cafes and restaurants. 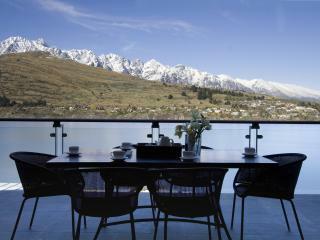 Offering spectacular views of The Remarkables and Lake Wakatipu, Mercure Queenstown Resort also enjoys all the convenience of being within easy reach of the city. The ideal place to base yourself, the resort offers easy access to the ski field in winter and is close to a variety of adventure and water sports activities in summer. Home to a gymnasium, tennis court, heated pool and spa, it’s the perfect place to warm up or wind down at the end of an action packed day. Conveniently located just 4 minutes from the heart of Queenstown, Mantra Marina offers 5 star self-catering apartment accommodation. Surrounded by amazing scenery yet close to the city centre, the hotel offers excellent value and is home to a great range of onsite facilities. With complimentary car parking, the hotel is ideal for those on a relaxing self-drive holiday or for the popular Queenstown ski season crowd.